Are you producing music? 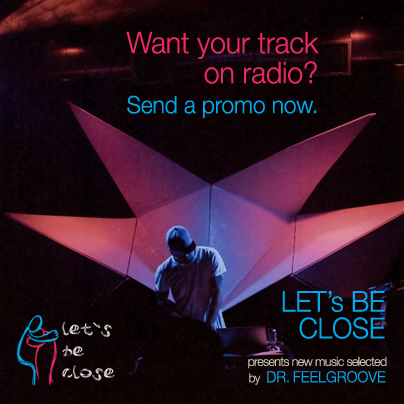 Do you want your track featured in ‘Let’s Be Close’ Radio Show as a demo? Then send your unreleased or new tracks via email: info@drfeelgroove.com. Be sure to write down “Demo” as email subject. We will be glad to know you, so feel invited to present yourself with few words or place a link to a page of yours. The selected tracks will be played on air by Dr.Feelgroove!